Are you looking for a career and not just another job? Consider becoming a professional truck driver. 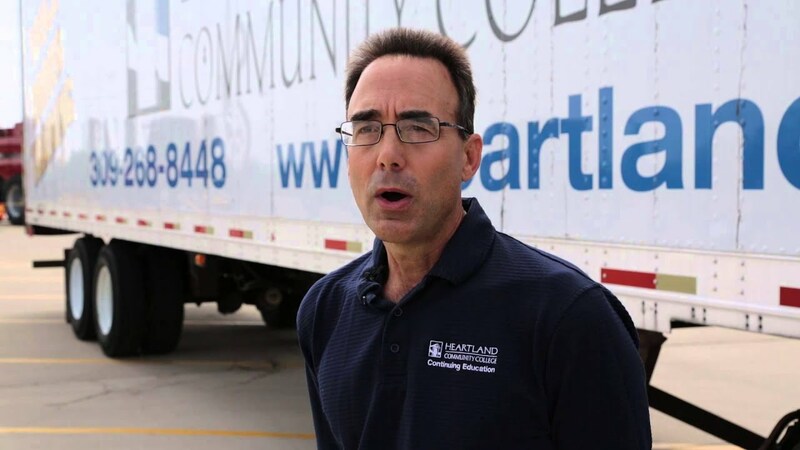 Heartland Community College’s Truck Driver Training Program will open the door to a lifetime of job opportunities. All types of truck driving jobs are widely available for those with a commercial driver’s license (CDL). Our 160 hour Truck Driver Training course prepares you to obtain a Commercial Driver’s License. The first week prepares you for the CDL Learner’s Permit. The remaining three weeks are behind the wheel training. At the end of the course, you will take a Class “A” License road test, administered by the Illinois Secretary of State’s Office. Instruction includes classroom lecture, demonstration and behind-the-wheel experience in a Class “A” vehicle. Have a current driver's license issued by the State of Illinois. Download and complete the DOT Physical/Drug screen form for OSF. Go to St. Joseph Medical Center (OSF Occupational Health) to have your screening done. At OSF you will turn in the DOT form and pay a $99 fee for the screening. The results will come directly to Heartland Continuing Education. The course fee is $4,049, of which a $608 down payment is required at registration. (See below for payment plan options and assistance.) The registration fee includes a criminal background check/Motor Vehicle Report. You are responsible for the $99 fee paid to OSF for the DOT physical/drug screen listed above. When you take the permit exam you are responsible for a $50 fee paid to the DMV. When you take the final road test for your CDL, you are responsible for a $50 fee paid to the DMV. Next available daytime class: May 28, 2019. This class is in Pontiac, IL. Refresher courses are available for those with a current or expired CDL. Our instructor performs a detailed needs assessment for a fee of $299. This fee includes a drug screening, which must be taken before the assessment is given. A report is completed and you are given an estimate of the practice hours needed. Refresher practice hours are billed at $129/hour. A Certificate of Completion to document your practice hours is available on request. This class is eligible for state grant money. We also have a limited number of Financial Scholarships. Call us at 309-268-8448 for more information.